You'd be a brave - or foolish - person to try and decide which is the most impressive; Supercell or GungHo Online. More seriously, there are similarities between the Finnish and Japanese companies, though. Both are massively experienced, with staff who have proven they can make great games for over a decade. Both are laser focused on the quality and fun provided by their game experiences. And actually, the companies did met up, as GungHo Online CEO Kazuki Morishita revealed through the translation of the company's US director of production Kenji Hosoi when we spoke during GDC 2013. "I think we have very similar cultures," Morishita says, although being a gamer through and through, he's notably tactful about the entire industry. "We've worked with companies such as EA and Ubisoft [on GungHo's console games]. I respect gaming companies and love playing their games," he comments. As aside, that's one reason GungHo won't be using gaming platforms such as Mobage or GREE anytime soon. "They are more like IT companies than games companies," says Morishita. "Sony, Microsoft, Nintendo, Apple, Google and Amazon are our platform partners." Indeed, despite running the most successful mobile games companies in Japan (if not the world), Morishita still ensures he plays games every day. Currently on God of War [Ascension, we presume], he also recently playedMetal Gear Rising: Revengeance, Assassin's Creed III [completed in two days flat], and Hitman: Absolution. These are all console games, but surprisingly perhaps, until 2011 when it released its first mobile game, GungHo Online was focused on PC and console titles, in part, thanks to its ownership of companies such as Acquire, Game Arts and Grasshopper. But it's on mobile, where Puzzle & Dragons is now rumoured to be making over $2 million per day that's the main subject for our discussion. "Any game we make, we expect it to be good, of the highest standard," Morishita says. "We were very confident that Puzzle & Dragons was a good game, but the success was mind-blowing. "It had a lot to do with luck," he adds. When pressed on the 'luck' aspect, Morishita clarifies, but only slightly. "It was intuition and luck," he concludes. What he means is intuition is a mixture of expertise and experience. 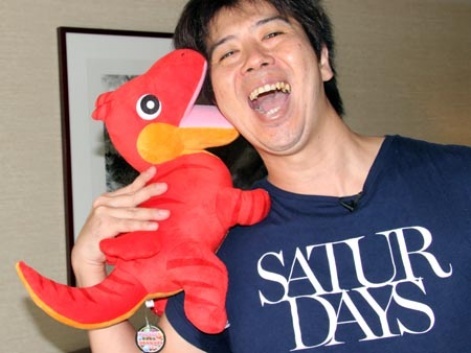 Significantly, GungHo went through a difficult time in the mid-2000s, partly because too much of Morishita's time was taken up with being company CEO. His response was to get back to doing what was important and what he wanted; being a hands-on creative. The other aspect of intuition is GungHo's history, operating online titles such as Ragnarok Online and making console games. These meant it could develop high quality mobile titles in terms of graphics, audio and general presentation, while also knew how to operate a game as a service - vital in the free-to-play world. As for trying to pin him down on exact user or revenue numbers, as CEO of a publicly traded company, Morishita wouldn't comment beyond saying that the game has 11 million users. "We believe having 11 million people playing and enjoying our game is more important than what they are paying," he states. Similarly, the news announced this week that largest shareholder SoftBank Mobile will pay $265 million to extend its 33.8 percent ownership of GungHo Online to 58.5 percent didn't excite Morishita much. "Nothing has really changed in terms of how we operate," he said. "It's just numbers." And on that basis, the fact that GungHo's market capitalisation (albeit on illiquid stock) is now worth $4.5 billion isn't something he thinks about. "Our focus is making great games, not the stock," comes back the response. "The worth of our company isn't the stock price, and if we start worrying about the stock price, that will change the way we work and make games.